UNITED NATIONS, Apr 28 2008 (IPS) - When a gaggle of unruly and starving peasants complained about a shortage of bread in 17th century France, the queen consort Marie Antoinette is said to have infamously remarked: "Let them eat cake." Historians have since disputed the apparently callous comment, arguing that she was either misquoted or mistranslated. However, there was no ambiguity about a statement attributed to the Bangladeshi army chief, General Moeen U. Ahmed, who told his compatriots last month that if they don't have rice, they should eat potatoes. As the current food crisis continues to spread across developing nations, the staple food of over 150 million Bangladeshis has been hit by spiraling prices – an increase of over 87 percent in March alone, according to the World Food Programme (WFP). 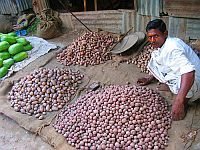 Bangladesh, which is expected to produce about 8.0 million tonnes of potatoes this year compared with 5.0 million tonnes in 2007, has been more pragmatic in switching from one staple to another. In the country's armed services, "The daily food menu now includes 125 grammes of potatoes for each soldier, irrespective of ranks," Gen. Ahmed, who is also head of the army-backed interim government, was quoted as saying at a recent luncheon for newspaper editors in the Bangladeshi capital. According to the Dhaka-based Daily Star, the luncheon menu included potato soup, french fries, potato corn curry, potato kopta curry, potato roller gravy, potato with spinach, potato malai curry, potato navaratna, potato pudina, and potato pulse. One journalist was quoted as saying that the army cooks, at the end of an exhausting day in the kitchen, had run out of recipes. Coincidentally, the boost for the tuber comes at a time when the United Nations is commemorating 2008 as the 'International Year of the Potato' in an attempt "to increase awareness of the importance of the potato as a food in developing nations." Bangladesh, categorised by the United Nations as one of the world's 50 least developed countries (LDCs), suffered two severe floods and a cyclone which destroyed about 3.0 million tonnes of food grains over the last year, according to published reports. The Bangladesh government is trying to stall a hunger crisis, which Secretary-General Ban Ki-moon says will affect some 100 million people worldwide, driving some of them to near-starvation. "The steeply rising price of food has developed into a real global crisis," he told reporters last week. WFP's Executive Director Josette Sheeran says that people in industrialised countries spend only about 15 to 18 percent of their household income on food, making them better equipped to cope with disasters and price hikes than households in developing countries which, on average, spend about 70 percent of their incomes on food. She said high food prices are "creating the biggest challenge that WFP has faced in its 45-year history, a silent tsunami threatening to plunge more than 100 million people on every continent into hunger." An agency that provides direct food aid, WFP has a core budget of about 3.1 to 4.3 billion dollars annually. But so far, it has raised only 1.0 billion dollars. "And of course, this 4.3-billion-dollar sum does not take into account the new face of hunger," says WFP spokeswoman Bettina Luescher. "So we will also need an as yet-to-be-determined amount that will allow WFP to begin addressing the needs of the new face of hunger – those people who could make it when bread was 30 cents per loaf, but cannot make it when bread is 60 cents per loaf," she noted. The secretary-general says the United Nations is very much concerned, as are all other members of the international community. "We must take immediate action in a concerted way," Ban said. The Economic and Social Council (ECOSOC), the primary U.N. body dealing with economic and social issues, is scheduled to hold a meeting on food security in mid-May, to be followed by a summit meeting of world leaders, sponsored by the Food and Agriculture Organisation (FAO), in Rome Jun. 3-5. The food crisis will also be on the agenda of the Group of Eight summit meeting of industrialised nations in Japan in July. Asked how the world body should deal with the food crisis, the secretary-general told reporters last week: "In the short term, we must address all humanitarian crises, which have been impacting the poorest of the poor people in the world because 100 million people have been driven into this additional hunger crisis." Ban said that last month, he convened the MDG [Millennium Development Goals] Africa Steering Group. At that meeting, he said, "We adopted several important recommendations, which approved as one of the initiatives to try to launch the African green revolution." He said he was going to discuss this matter in depth with all the agencies, heads of agencies, funds and programmes of the United Nations, as well as the World Bank and the International Monetary Fund. "Then, we will try to see what kind of immediate action and immediate long-term actions we can take as a part of a United Nations-led initiative," he added.